We have been successful in securing funding from the Integrated Care Fund to run a new project aimed at promoting improved health and well-being. This is a 10 month project, from June 2017 – April 2018. 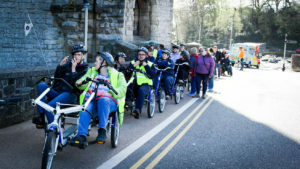 ‘Anturio Ymlaen’ is project aimed at transforming health and well-being opportunities for those with physical or learning disabilities, by planning and arranging new and varied activities that will appeal to a wide range of individuals, and encouraging them to take part and enjoy themselves. This enables adults with learning disabilities, including older adults, to increase their fitness levels and well-being, plus results in increased social interaction and happiness – with the aim of decreasing health issues in the long term. Singing and dancing and social skills – developing creative opportunities, by cooperating with the ‘Gefail Yr Ynys’ project in Caernarfon, as well as singing sessions and taking part in the National Eisteddfod.